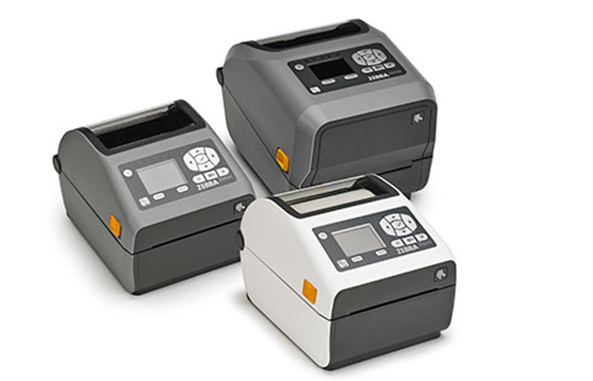 Thermal barcode printers are available in five basic types. These are DESKTOP, COMMERCIAL, HEAVY-DUTY, MOBILE and ID CARD models. 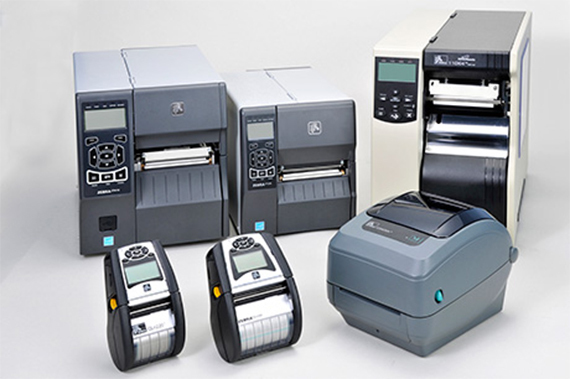 Not sure which barcode printer is best for you? CALL TODAY to discuss your project and let us recommend the barcode printer scanner that is best suited for your bar code labeling requirements. RVB Systems Group provides barcode printers from Zebra Technologies. Zebra barcode and RFID printers are available with many options, such as built-in Ethernet capability, internal rewind, high density printheads, etc. RVB Systems Group is available for on-site installation, training and system development involving any of these thermal barcode printers. ZEBRA industrial / commercial barcode printers. Your best choice for most industrial and commercial barcode printing applications. ZEBRA heavy duty barcode printers. Select these type of printers when you need mission critical labeling equipment. Wireless mobile printing solutions for any type of mobile application. ZEBRA photo ID card printers. Create and print identification cards on credit card size blank cards. RVB Systems Group sells blank cards and ribbons for all types of photo ID card printers. What is a thermal barcode printer? How does a thermal transfer barcode printer work? When should I use a thermal printer instead of any other type of printer? What type of barcodes can be printed by different types of printers? How do I create and print barcode labels? A thermal barcode printer prints labels using a heated printhead. The printhead ‘burns’ an image directly onto a label (DIRECT THERMAL) or transfers an image onto a label using a ribbon (THERMAL TRANSFER). Thermal printers can also print and encode smart labels, which contain a radio frequency identification (RFID) chip and antenna inlay embedded within the label media. There are two thermal printing methods used to print bar codes: direct thermal and thermal transfer. Each method uses a thermal printhead that applies heat to the surface being marked. Thermal transfer printing uses a barcode printer ribbon to TRANSFER durable, long-lasting images from a ribbon onto a label. Direct thermal printing does not use a ribbon. This method prints DIRECTLY on a label. Thermal transfer printers can accept a wider variety of materials and are usually used for permanent or long-lasting labeling applications such as asset tags and product labels. Direct thermal printers are usually used to produce labels shipping labels, picking labels, receipts, and other common print jobs. Thermal transfer printers can be used with or without a ribbon. Direct thermal printers cannot use a ribbon.Direct thermal labels are more expensive than thermal transfer paper labels, but the cost of the ribbon should be considered when comparing total costs. Thermal transfer technology can be used to print on a wide range of materials, including paper, tag stock, wristbands, polyester, polypropylene, and other synthetic materials. The thermal transfer process is accomplished in a thermal transfer printer by applying a voltage to the printhead that consists of 200 to 600 resistive heating elements per linear inch of printhead (dpi-dots per inch). The resistive material is covered by a thin coating or “glaze” that protects the heating elements from abrasion as the thermal transfer ribbon makes contact with it. The line of printhead elements is in direct pressure contact with the back side of the thermal transfer ribbon. The ink side of the ribbon is in direct contact with the receiver or label stock. This ribbon and receiver “sandwich” is driven by a rubber-covered platen roller under the printhead print line at a speed consistent with the heating cycle time of the printhead. Heat from the printing elements raises the ink to a temperature above its melting point. At this time the ink from the ribbon transfers from to the receiver and adheres to it. Together, the ribbon and receiver continue to move from under the printhead for a short distance before separation of ribbon and receiver occurs. It is at this point that the image is formed. When should I use thermal barcode printers instead of any other type of printers? Thermal bar code label printers support multiple types of barcode symbologies. General-purpose laser and inkjet printers and software applications may not be able to natively print any bar codes or may not offer multiple barcode symbologies. Printer specifications list symbologies that are supported. Just as with like any other printer, you need to install a printer driver in order to communicate with a thermal printer from a PC. You may decide to use existing generic software packages such as MS Word or you may decide to use a specialized software package such as Bartender, Loftware, or any of the other dozen or so barcode labeling packages on the market today. These packages make designing and printing labels easy and are recommended for most labeling projects. If you use one of these software packages, you should use the printer driver provided with the software, not the driver provided with the printer. CALL TODAY to discuss your project and let us recommend the barcode label printer that is best suited for your labeling requirements. Need to track inventory or fixed assets. Click HERE to learn more about Track ‘Em, an Inventory and Fixed Asset tracking application that can be used with any of the barcode scanners available from RVB Systems Group.